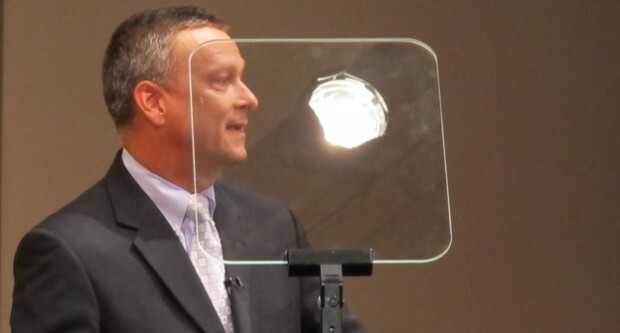 A teleprompter aids state superintendent Tony Bennett as he delivers a televised address in September 2011. Buoyed by a rising political stock and several big-ticket national contributions, Republican State Superintendent of Public Instruction Tony Bennett has already raised more than twice the amount of campaign cash he did in his initial bid for office in 2008. Bennett has brought in $1.3 million in campaign contributions since his election four years ago — more than $812,000 in 2012 alone — with the thick of the political fundraising season still to come. By contrast, Democratic challenger Glenda Ritz has raised $112,000 to date, largely from the political arms of the state’s teachers unions. A majority of Bennett’s campaign funds come from contributors in Indiana. But roughly 40 percent of his campaign cash has come from out-of-state givers, including from a company tapped to lead a school takeover and from the mayor of New York City. 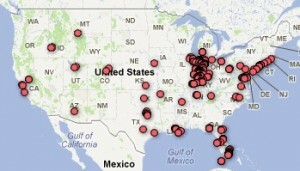 We’ve put together a map of contributions to the Bennett campaign and a sortable database along with it. We’ve also compiled a list of the contributions to Ritz’s campaign, which you can view here. Indeed, out-of-state contributions tend to raise eyebrows, says Andrew Downs, who directs the Mike Downs Center for Indiana Politics at IPFW. But he says such gifts are not unusual for candidates running for statewide office — even in down-ballot races — and adds Bennett’s high fundraising numbers more likely reflect his rising political star. Voters in 14 U.S. states elect their own top school official. Indiana is one of ten states that does so on a partisan ballot. In California, North Dakota, Washington and Wisconsin, the state’s top school official is a non-partisan elected position. Alice Walton (Bentonville, Ark.) — $200,000. Columnist and Bennett critic Karen Francisco first picked up the story of this contribution in the Fort Wayne Journal Gazette. The Walton Family Foundation donated more than $25 million to the KIPP network of charter schools late last year. Dean White (Merrillville, Ind.) — $125,000. The Merrillville hotel developer has donated more than $3.4 million to mostly Republican candidates in Indiana since 1998. Christel DeHaan (Indianapolis, Ind.) — $75,000. We’ve reported on the Indianapolis charter school her philanthropic foundation runs — one of four throughout the world. Another active political contributor, DeHaan has given more than $2.5 million to both GOP and Democratic candidates and sits on the Indiana Education Roundtable. Hoosiers for Economic Growth PAC (Indianapolis, Ind.) — $45,000. Along with many of the state’s top Republican contributors, the Hoosiers for Economic Growth Political Action Committee receives the lion’s share of its dollars from two main sources: First, the committee has received $250,000 since 2008 from Indiana native, Utah resident, Overstock.com founder, “Warren Buffett protégé” and Friedman Foundation for Educational Choice chairperson Patrick Byrne — himself an individual donor to Bennett’s campaign. Second, since 2008, the Terre Haute-based American Federation for Children Action Fund — which, Steve Hinnefeld notes, supports private school vouchers — has contributed more than $460,000 to Hoosiers for Economic Growth. 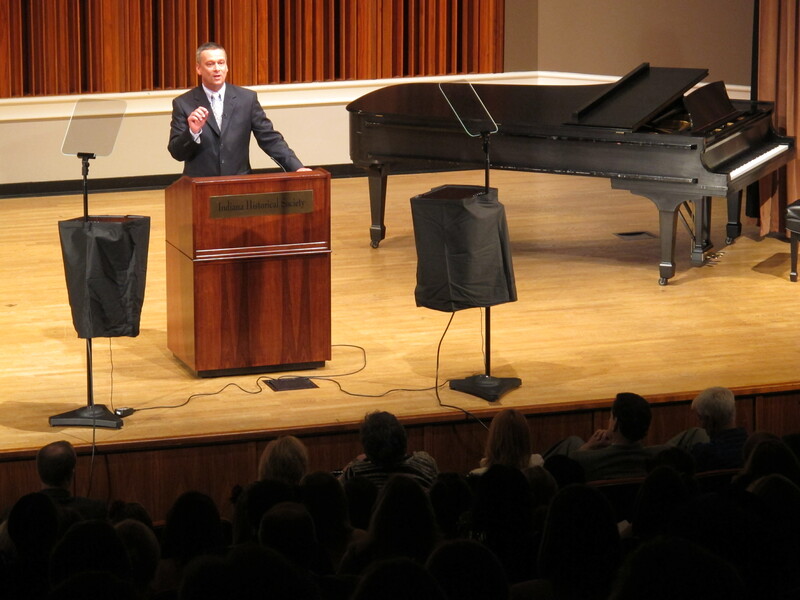 New York City mayor Michael Bloomberg contributed $40,000 to Tony Bennett's campaign for re-election. 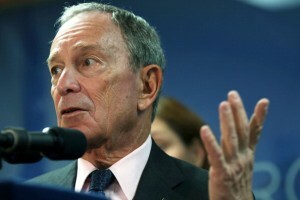 Michael Bloomberg (New York, N.Y.) — $40,000. Yes, as in this Michael Bloomberg, who has championed school choice as mayor of the nation’s largest city. Bennett’s opponent, Glenda Ritz, has received roughly two dozen contributions. 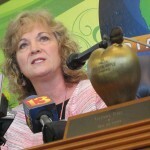 Infusions of cash from I-PACE — the Indiana State Teachers Association’s PAC — and the Indiana Federation of Teachers, make up more than 90 percent of the amount in Ritz’s campaign coffers. Though Bennett is an incumbent and has been campaigning far longer than Ritz, in the time period since Ritz received the first of $112,000 in total contributions to her campaign, Bennett has raised more than four times that amount — $450,000. A spokesperson for Bennett’s re-election campaign says contributions reflect excitement about changes in Indiana education policy. 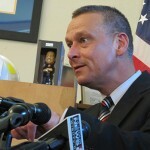 In the 2008 campaign, Bennett faced Democratic candidate Richard Wood. At the time, both were former superintendents and political newcomers. Bennett raised about $483,000. Wood raised about $67,000, but received smaller contributions from organizations affiliated with the state’s teachers unions than Ritz is receiving this year. Bennett’s critics say the influx of out-of-state donations indicates more trouble is ahead for traditional public schools. They contend traditional public education is hurt by the pro-charter, pro-voucher policies for which Bennett has advocated. IPFW political scientist Andrew Downs cautions against attributing too much meaning to large campaign contributions. State superintendent Tony Bennett delivers the first "State of Education" address in Indianapolis in September 2011. “There’s no doubt contributions get you access,” Downs says, giving you a better chance of having a candidate’s ear once he or she is elected. But, Downs expounds, there is a system of “checks and balances” in place to ensure a campaign contribution does not have undue influence on the awarding of a government contract, for example. We wrote a few months ago about Edison Learning, the educational management company that donated $1,000 to Bennett’s campaign in 2009. Nearly two years later, Edison Learning was tapped to turn around Gary’s Roosevelt High School. Bennett says the contribution had no effect on the decision to select the company. “Given the scope of the money that’s involved [in the state takeover process], I would tell you that if all they gave me was $1000, and they’re looking for a contract, I’m a pretty cheap date,” Bennett told a Gary audience in September, drawing a laugh from the crowd. School management company Charter Schools USA donated $1,500 to the Bennett campaign in February, several months after state education officials selected them to run four takeover schools in Indianapolis.